New Zealand has the most rigorously enforced and successful all-age mandatory bicycle helmet law in the world with a helmet wearing rate consistently around 93% since enactment in 1994. New Zealand is the only country apart from Australia which actively enforces mandatory all-age bicycle helmet laws nationally (although adults are exempt in the Northern Territory of Australia). In the 10 years to 2012, approximately 2% of the entire New Zealand population were fined (NZ$55) for not wearing a helmet when cycling. This page details the public health and safety results since 1994 that have been ignored by New Zealand's media and politicians. Link to or download a summary of New Zealand's public health and safety disaster, a 590kb PDF file you can reference or email as an attachment to legislators or media if mandatory bicycle helmet laws are threatened in your part of the world. February 2012: The New Zealand Medical Journal published Evaluation of New Zealand's bicycle helmet law (PDF 209kb) by former British Cycling Federation coach and road safety instructor Colin F Clarke, showing a massive plunge in cycling levels and a 20% higher accident rate since helmet law enforcement. 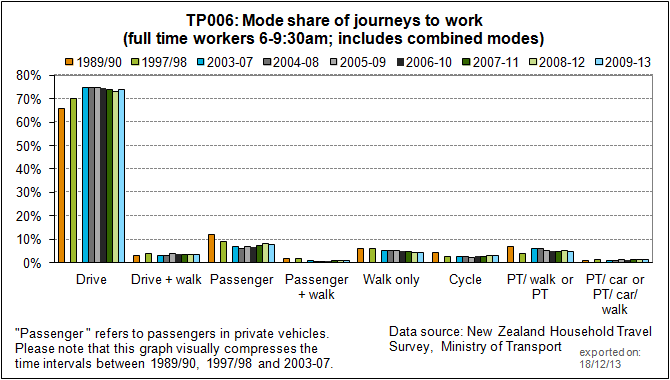 Public on-road cycling participation in New Zealand fell by 26% between 1989 and 1998, according to the Land Transport Safety Authority Cyclist Travel Survey (PDF 108kb page 42). New Zealand's population increased by 406,390 - or 11% - during that time. In the five years prior to 1994, average annual cyclist injury totals were 991. In the five years after 1994, average annual injury totals were 707 - a reduction of 29%. 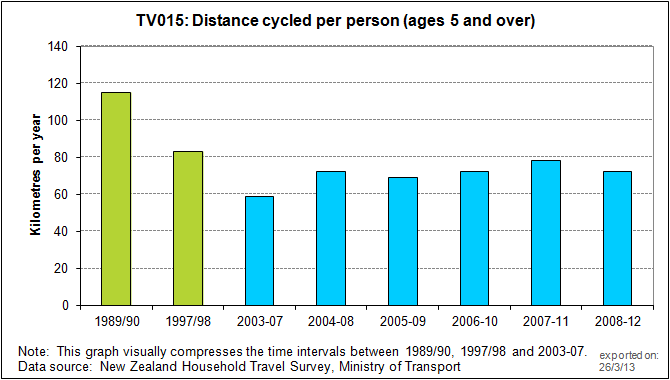 The LTSA estimate of total New Zealand bicycle trips dropped from 181.5 million in 89/90 to 110.8 million in 97/98. Estimated hours of cycling fell from 39.2 million to 26 million, and the number of kilometres cycled dropped from 351.6 million km to 284.2 million km. Cycling trip numbers in New Zealand plunged by 51% from 1989 to 2006 (PDF 72kb), according to LTSA figures, with crash rates for fatalities dropping by 51% and by just 21% for serious crashes. Data from the New Zealand Household Travel Survey and the Otago University Injury Prevention Research Unit's Injury Query System allow a comparison of cycling participation and the number of cyclists discharged from public hospitals since 1989-1990, before 1994 all-age bike helmet law enforcement, through to 2017. The two graphics below chart the participation and cyclist hospital discharge averages since 1989-1990 in both hours and kilometres cycled per year by 5yo+, along with a risk of injury per cyclist. Data from the Annual road toll historical information, published by the New Zealand Ministry of Transport and tabulated below, allows a comparison of the fatality totals for different roads users during the four years before and after 1994 all-age bike helmet law enforcement, as well as averages comparing 1990-93 with 1995-2016. 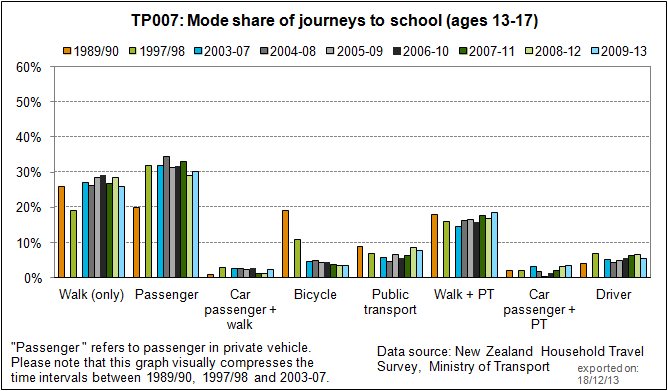 Data from the New Zealand Household Travel Survey 2015-2017, published by the New Zealand Ministry of Transport, allows a comparison of averaged cycling participation and averaged fatalities between pre-law 1989-90 and 2015-17. The fatality data above suggest that cyclist deaths have fallen at about the same rate as other road users following 1994 bike helmet law enforcement, particularly motorcyclists and pedestrians, with the only difference being that no other road user saw a 40-60% drop in participation. Data from New Zealand Household Travel Survey 2009–2013 (NZHTS), published by the New Zealand Ministry of Transport in May 2013 and New Zealand Ministry of Transport Cyclist Crash Statistics show the country hasn't recovered from its plunge in cycling participation following 1994 helmet law enforcement. The trends suggest a generational decline as discouraged youngsters have become adults since 1994 and are not replacing the ageing baby boomers who are gradually giving up cycling. Despite this enormous reduction in total cycling and cycling to school among all age groups, the proportion of cyclist deaths and injuries among all New Zealand road casualties has increased since the helmet law was enforced. Cycle helmet use: Results of national survey, March/April 2012, published by the New Zealand Ministry of Transport in May 2015, shows that the national bicycle helmet wearing rate averaged across all age groups from 2004 to 2015 was 92.5%. Data from Otago University Injury Prevention Research Unit and New Zealand Household Travel Survey 2009–2013 can be tabulated to determine the rates of 5yo+ cyclist participation, injury per population and injury per cyclist from 1988 to 2011, with all data adjusted for increasing population gauged by Statistics New Zealand. This pop-up table is based on the Ministry of Transport surveys of 5yo+ cycling participation as a percentage of population, as displayed above, with trends smoothed to compensate for the irregularity of the survey timeline. The government and university data show that 5yo+ hospitalised injuries per cyclist in New Zealand increased 74.6% from the pre-law period of 1988-1994 to post-law 1995-2011. Note that the demographic and total estimates of cycling participation tabled and charted above do not represent total New Zealand participation or cycling in a given year. They are based on New Zealand Household Travel Survey 2009–2013 percentages of survey responses over two days. They are best considered as population percentages who cycle regularly and, as such, can be compared with the survey estimates of people who have cycled at different frequencies over the previous year. The NZHTS two day survey response ratios used in the calculations above might be described as representative of people who cycle two or three times per week in New Zealand, with an underestimate of 5-12yo cycling and an overestimate of cycling among older people. The NZHTS survey methodology is consistent since 1989/90 and provides a fairly accurate gauge of regular cycling among different age groups. A New Zealand cycling participation/injuries 1988-2011 Excel data spreadsheet can be downloaded for the tables and charts above. New Zealand cycling downturn began in 1994 provides evidence supporting the choice of 1994 as the exact year that participation began to fall. Alternatively and to gauge New Zealand injury rates over the past decade, cyclist hospital injury data can be obtained from the New Zealand Ministry of Health and compared with Ministry of Transport data for the annual distance cycled per person aged 5yo+ and the annual number of cycling trip legs per year aged 5yo+, each averaged within time blocks of 2003-07, 2004-08, 2005-09, 2006-10, 2007-11 and 2008-12. It is noteworthy when analysing the decine in New Zealand child cycling to consider Changes in body mass index in 11-12-year-old children in Hawkes Bay, New Zealand (1989-2000) which found a 9.2% increase in BMI during the 12 years, with the risk of overweight being 2.2 times greater in 2000 than 1989 and the risk of obesity being 3.8 times greater. By 2006/07, one in five New Zealand children were overweight and 8.3% were obese. Changes in Head Injury with the New Zealand Bicycle Helmet Law (Word file 96kb) is an analysis by researcher Dr Dorothy Robinson into the impact of the mandatory bicycle helmet law in New Zealand. In January 2010, Auckland Cycle Chic considered how mandatory helmet laws are hampering bike share schemes in New Zealand. October 22 2008: New Zealand Transport Safety Minister Harry Duynhoven acknowledges people may not be using bicycles because of the helmet law and wonders how many people would be cycling in New Zealand if they didn't have to wear one. Listen to his comments here. Results: Cyclists had the second highest rate of traffic injuries compared to other major road user categories and the rate increased from 1996-99 to 2003-07. During 2003-07, 31 injuries occurred per million hours spent cycling. Non-collision crashes (40%) and collisions with a car, pick-up truck or van (26%) accounted for two thirds of the cycling injuries. Children and adolescents aged under 15 years were at the highest risk, particularly of non-collision crashes. The rate of traumatic brain injuries fell from 1988-91 to 1996-99; however, injuries to other body parts increased steadily. Traumatic brain injuries were most common in collision cases whereas upper extremity fractures were most common in other crashes. Conclusions: The burden of fatal and hospitalised injuries among pedal cyclists is considerable and has been increasing over the last decade. This underscores the development of road safety and injury prevention programmes for cyclists alongside the cycling promotion strategies. 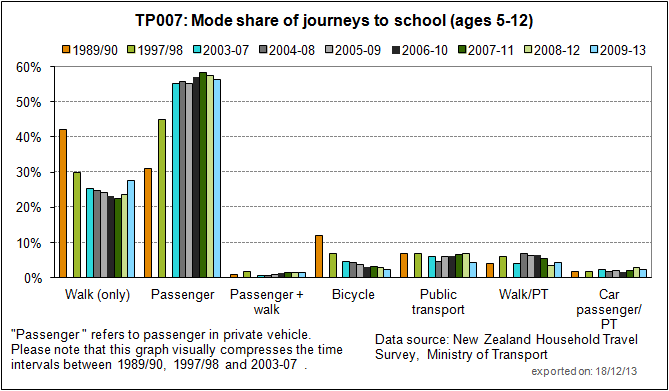 Charts below published in 2012 by the New Zealand Ministry of Transport show the country has never recovered from the devastating decline in public cycling participation following 1994 mandatory helmet law enforcement. The graph above shows how the proportion of New Zealanders cycling to work has almost halved since the mandatory helmet law was enacted in 1994. This graph is sourced to North Shore City research (PDF 236kb). As stated on the North Shore City website (under Transport and Cycling): Very few cyclists get injured on the road, and about half of all cycle injuries are in off-road situations. Research shows that the health benefits of cycling out-weigh the injury risks by a factor of 20 to 1. The graph above suggests the massive cycling downturn caused by New Zealand's mandatory helmet law has resulted in significant harm to public health. Below is data since 1988 showing all New Zealand public hospital discharges, cycling trips and total motor vehicle casualties. The data sources (New Zealand Ministry of Transport and Otago University Injury Prevention Research Unit) are linked. There is no evidence that mandatory helmets reduced cyclist injuries/hospital admissions relative to overall road safety trends, despite the law causing a 51% reduction in public cycling participation and an average 90% of remaining cyclists wearing helmets. The chart below shows total New Zealand public hospital discharge of cyclists involved in motor vehicle crashes since 1988 relative to the hospital discharge of pedestrians and total motor vehicle casualties. Again there is no evidence that helmets reduced cyclist injuries relative to road safety trends. The chart below shows total New Zealand public hospital discharge of cyclists since 1988 relative to cycling participation. The chart below shows total New Zealand public hospital discharge of cyclists since 1988 relative to all other motor vehicle traffic crash discharges as defined by Otago University's Injury Prevention Research Unit. The chart below shows total New Zealand cyclists casualties since 1951 relative to all other road casualties, sourced to data from the New Zealand Ministry of Transport. All New Zealand government data shows the cyclist injury rate runs parallel with broader road safety trends, with no influence from the 1994 helmet law - EXCEPT that both the Otago University IPRU and Transport Ministry datasets show an upward jump in non-cyclist casualties coinciding with the helmet law introduction. This replicates evidence in other all-age mandatory bicycle helmet jurisdictions that the overall road toll is worsened by large numbers of discouraged cyclists driving their cars instead (e.g in Australia). "Of particular concern are children and adolescents who have experienced the greatest increase in the risk of cycling injuries despite a substantial decline in the amount of cycling over the past two decades. The travel surveys show that from 1989/90 to 2005/08, the average time spent cycling per week decreased from 28 minutes to 8 minutes among those aged 5-12 years and from 52 minutes to 12 minutes among those aged 13-17 years. Likewise, from 1989/90 to 2004/08, cycling to school declined from 12% to 4% while being driven to school increased from 31% to 55%. Parents' safety concern is one of the main reasons why children don't cycle or walk to school although a wide range of factors can influence such behaviour. If more children are driven to school, they will have less opportunity to develop cycling and road safety skills and traffic will be increased, posing more danger and initiating a vicious circle that can have an adverse impact on risks of injury as well as levels of physical activity (see Submission to draft National Road Safety Strategy). To address this, some initiatives have been developed in New Zealand, including the Walking School Bus Programme, school-based cycle trains and cyclist skills training. Our analysis showed the declining trend in rates of traumatic brain injuries from 1988-91 to 1996-99. However, it is unclear whether this reflects the effectiveness of the mandatory all-age cycle helmet law implemented in January 1994 or simply reflects a general decline in all road injuries during that period. On the other hand, we found a steady increase in injuries to other body parts over the twenty year period. Bicycle helmet wearing rates in New Zealand monitored by the Ministry of Transport show that strict police enforcement has maintained a level between 92% and 94% up to 2010. New Zealand Bicycle Helmet Law - Do the Costs Outweigh the Benefits? 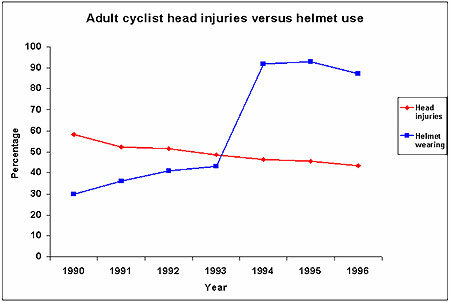 is a 2002 cost-benefit analysis by M. Taylor and P. Scuffham from the Centre for the Analysis of Safety Prevention and Attitudes to Risk (University of Newcastle-upon-Tyne) that concludes "the Helmet Wearing Law was cost saving in the youngest age group but large costs from the law were imposed on adult (>=19 years) cyclists". Hansen, P. and P.A. Scuffham. Australian Journal of Public Health, 1995. 19(5): p. 450-4. This paper examines the cost-effectiveness for primary school children (age 5-12 years), secondary school children (13-18 years) and adults (over 18 years) of the legislation enacted on 1 January 1994 requiring road-cyclists in New Zealand to wear helmets. The cost to cyclists not in possession of a helmet before they became compulsory of either obtaining one or quitting cycling was compared with the number of deaths and hospitalisations expected to be prevented over the average life of a helmet. Corresponding to Victorian and United States estimates of the efficacy of cycle helmets at preventing serious head injuries, the cost per life saved was $88,379 to $113,744 for primary school children, $694,013 to $817,874 for secondary school children, and $890,041 to $1,014,850 for adults (New Zealand dollars = approximately 0.95 Australian dollars). The cost per hospitalisation avoided was $3304 to $4252, $17,207 to $20,278, and $49,143 to $56,035 respectively. These estimates are extremely sensitive to the estimated efficacy of helmets at protecting cyclists. Mainly anecdotal evidence for New Zealand suggests that they are not to be very effective at preventing serious head injuries; future research into the change in injury patterns as a result of the helmet regulation would be valuable. Nonetheless, the ranking of the abovementioned estimates does not contradict the policy in some parts of the world requiring helmets for children and/or teenagers, but not adults. Costs and Benefits of the NZ Helmet Laws (Word file - 76kb) by Dr Dorothy Robinson analyses the findings of Taylor and Scuffham's cost-benefit analysis of the New Zealand legislation. February 17 2009: Enquiries are launched after a New Zealand cyclist not wearing a helmet is pepper-sprayed by police and his bicycle is rammed by a police car. New Zealand enacted all-age national mandatory bicycle helmet legislation in 1994. Below are the fatalities each year since 1985 for all road user types in New Zealand. The data shows that in the eight years before 1994, Motor Vehicle Occupant deaths averaged 481 per annum, falling to an average 378 per annum in the following eight years. This is a reduction of 22%. Motorcyclists: 114 per annum pre law, 46 per annum post law (down 59%). Pedestrians: 91 per annum pre law, 56 per annum post law (down 38%). Cyclists: 20 per annum pre law, 13 per annum post law (down 34%). It is clear that cyclist fatalities did not fall at any greater rate than for other road users after law enforcement in 1994, particularly in view of the reduction in cycling popularity caused by the mandatory helmet legislation. For New Zealand cyclist and pedestrian fatality rates from 1976 to 2002, click here. In June 2007, the Journal of Paediatrics and Child Health published the research paper Changing pattern of child bicycle injury in the Bay of Plenty, New Zealand by Simon A Moyes from Whakatane Hospital. Aim: To determine if helmet laws and safety campaigns have had an impact on bicycle injuries in children. Methods: A comparison of the number of bicycle injuries presented to Whakatane Hospital's Emergency Department in the period 1982-1986 to the period July 1998-December 2005. Results: In the first period there were 597 per 100 000 presentations per annum which increased to 890 per 100 000 per annum in the later period (P = 0.01). Fractures increased from 115 to 234 per 100 000 per annum respectively (P = 0.02). Injuries from a collision with a moving motor vehicle decreased from 72 to 30 per 100 000 per year and of those the proportion of serious head injuries dropped from 65% to 33%. There were four deaths in the earlier period but none in recent years. Conclusions: Injuries from bicycle use have increased but there has been a marked reduction in collisions with motor vehicles. This is a result of the changing use of bicycles by children. In other words, either through changes to the law, infrastructure improvements or personal choice, less children cycled on roads and were less exposed to vehicles. Wearing a helmet does not reduce a cyclist's chance of collision with a vehicle, it only affects the outcome of the collision (although there is solid evidence helmets increase the risk of accidents through personal risk compensation). The research again confirms findings around the world that the mandatory wearing of helmets increases the risk of cyclist accidents/injuries by about 30%. Mandatory helmet law supporters are satisfied that helmet wearing increases the risk of injury to all cyclists, including children. In September 2011, the Palmerston North local council has adopted a plan to encourage the use of bicycles, noting that "cycling had declined 25 per cent in Palmerston North between 1996 and 2006". A June 2007 study has found a third of New Zealand cyclists were involved in at least one accident in the previous year. As stated in the story, "Previous studies by Dr Thornley have found that New Zealand has relatively high rates of cyclist injuries compared with other countries. He believed this to be largely down to cycling being a more common practice elsewhere. In other countries where cycling is much more common, and a more integrated and accepted form of transport, the risk of injury is much, much lower." Fewer cyclists and more injuries - the usual result in a mandatory bicycle helmet jurisdiction. A Submission on Road User Rules (PDF 190kb) by University of Canterbury senior fellow Dr Nigel Perry details the failures and need for repeal of mandatory bicycle helmet legislation in New Zealand. In July 2000, Public Health Physician Dr Ashley Bloomfield presented "Cycling: your health, the public's health and the planet's health" (PDF 24kb) to the New Zealand Cycling Symposium at Palmerston North. So what is the debate about helmets? The evidence on which decisions were made about introducing legislation was relatively sound. Sure, helmets can be hot and uncomfortable on warm days. Yet my own personal experience is that a helmet can be, quite literally, a lifesaver. The earliest murmurings that I heard against helmets were from a neurosurgeon who I worked for in 1994. He claimed that cycle helmets were turning what would have been focal head injuries, perhaps with an associated skull fracture, into much more debilitating global head injuries. We had a couple of examples on the ward at the time, and it was a bit worrying. However, I wasn't too convinced as I figured that the injuries that would previously have been focal head injuries may well have been resulting in death, so the neurosurgeon was never actually seeing them. Instead, they were making their way straight to the pathologist. The debate now centres on two issues. First, there is some evidence that, ceteris paribus, increases in cycle helmet wearing have not resulted in the anticipated reduction in the frequency and severity of head injuries to cyclists. New Zealand-based research from the early 1990s demonstrated no decline in the percentage of serious head injuries to cyclists as a percentage of all serious cyclist injuries presenting to hospital. Opponents of compulsory helmet legislation may have a point: the accumulating evidence suggests that the reduction in head injuries expected of legislation may not be as large as anticipated in practice - and may in fact be outweighed by the disbenefits because of reduced levels of cycling. In accordance with the CAN policy statement, we ask for a review of the mandatory helmet law. Both the Ministry of Transport and the LTSA have heralded the helmet legislation as a success, claiming around a 20% drop in injuries over the 6 years of the law (i.e. an average reduction in injuries of 3.3% per year). The latest LTSA Travel Survey Report shows a drop of 34% in bicycling hours over the 9 years from 1989-1997 (i.e. an average reduction in bicycling hours of 3.8% per year). As injuries and bicycling hours have reduced in a very similar manner, CAN concludes that the mandatory helmet legislation has failed to meet its objective of increasing bicyclists' safety. Given the major health benefits of bicycling (we make reference to the Transfund consultation document about inclusion of general health benefits into the Project Evaluation Manual), and lack of environmental impacts, any drop in bicycling is a major disbenefit. Overseas evidence suggests that the introduction of compulsory helmet legislation results in a significant proportion of bicyclists to change modes. Given the disbenefits, and the apparent lack of benefits, CAN suggests undertaking a review of the legislation as part of the Road User Rule process. For example, research has shown car users would benefit far more from wearing helmets than bicyclists and an examination of this discrepancy should be part of the review of the legislation. In our view, far more important issues than compulsory bicycle helmets determine road safety for bicyclists. Urban speed management, segregated pathways in rural areas, driver and bicyclist education, enforcement of reckless driver behaviour towards bicyclists, and 'share the road campaigns' could potentially be far more significant. Trying to meet the bicycle helmet wearing targets may get in the way of dealing with these considerably more important road safety issues for bicyclists. It should be noted that there is a wide range of views on helmet wearing within CAN's membership, from strong supporters to strong opponents. However, CAN believes that an investigation into the effect of the mandatory helmet legislation on bicyclists and bicycling is long overdue. Sensible conclusions about its effectiveness cannot be made without such research. November 2, 2005: Read in the New Zealand Herald how the helmet law has sparked more public disrespect for police with a violent struggle between a cyclist and an officer while members of the public watch on and take photographs. Cycling Health New Zealand presents data to argue for repeal of the legislation in New Zealand - one of only two countries in the world with uniform national all-age mandatory bicycle helmet laws. The problem of female cycling discouragement has been identified in New Zealand university research. On June 19, 2008, former New Zealand traffic police chief Superintendent Steve Fitzgerald was killed when cycling home from work, the second cyclist death in the the Hutt Valley that day. Read about the New Zealand police officer who in October 2009 faced charges for allegedly assaulting a cyclist for not wearing a helmet and then trying to ram him into a bank building with his car.